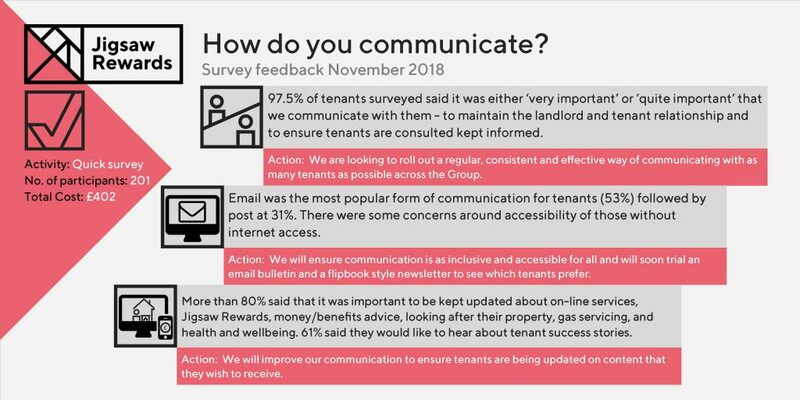 Jigsaw now has a much larger number of tenants across more geographical areas and this Jigsaw Rewards survey was ask to tenants how they’d like us to communicate updates with them so that we can be as consistent and inclusive as possible in our communication across the Group. This includes how important tenants felt it was for us to communicate with them and about what, how often they’d like to receive updates and via which channels. 5% of tenants surveyed said it was either ‘very important’ or ‘quite important’ that we communicate with them so that they are kept informed, consulted with and to maintain relationships between the landlord and the tenant. More than 80% of people said it was important for them to be kept updated about on-line services, Jigsaw Rewards, money/benefits advice, looking after their property, gas servicing, and health and wellbeing. 61% said they would like to hear about tenant success stories. Other suggestions for kinds of information tenants would like to be communicated on include; investment/maintenance works, repairs, community activities, rent/service charge increases, staffing structures and contacts. Around 71% of tenants across the Group use Facebook, followed by Twitter (almost 26%) and Instagram (32%). However, 23% of tenants across the Group said they followed their landlord on social media. This was more common for East tenants. Email was the most popular form of communication for tenants (53%) followed by post at 31%. 7% said they’d prefer to visit our website and 6% preferred the online hubs. 3% preferred to receive updates via social media. Some tenants praised previous newsletters and face-to-face contact. Some tenants expressed concern about those who either didn’t have internet access/computer literacy skills or who had disabilities which could exclude them from receiving forms of contact. Most tenants preferred to receive updates monthly closely followed by as and when needed. Most tenants completing the survey used a smartphone or laptop to check for updates more frequently than PCs or tablets. We’re taking note of comments around inclusiveness and accessibility, particularly for our older tenants, those living in sheltered and/or retirement schemes and our BME communities. While social media has not been the most common method of communication among people surveyed, we will continue to use this as an additional tool to share updates with tenants due to its immediacy and cost effectiveness. East has also seen good engagement levels especially via paid-for sponsored posts which maximise exposure of messages for very little costs. We will ensure all communication is GDPR compliant. Thanks to everyone who gave their feedback and look out for further surveys to help us improve how we communicate with you. If you would like to take part in surveys like this, join Jigsaw Rewards today!